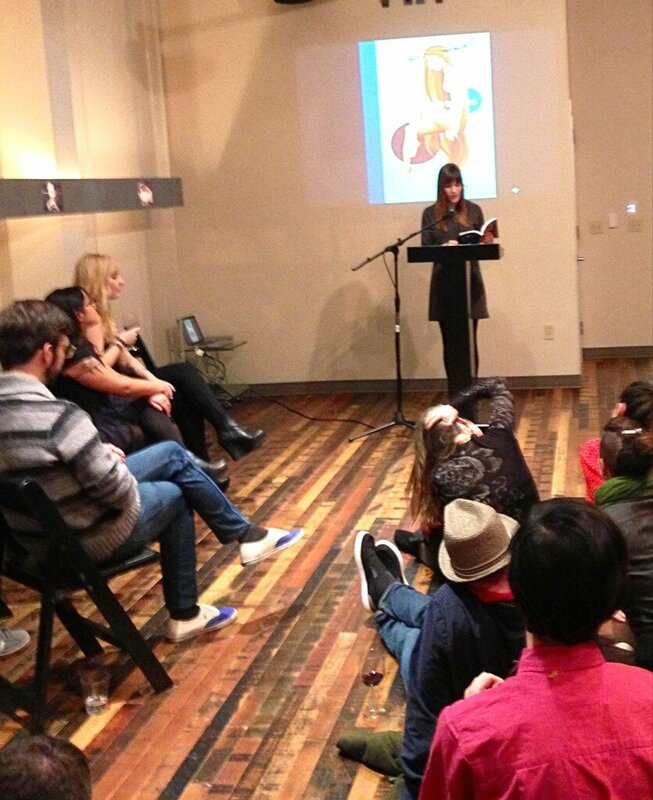 Last Friday, I read my short story “Father and Daughter” at Portland Review‘s winter issue release party. I wrote the story, about a teenage girl and her gambling addict divorcee father, after visiting my parents this past fall. There is a huge casino near my parents’ house that is something of a landmark in their area. I’m often inspired when I return to the familiar landscape of Central Washington. There is a regeneration that occurs for me in that desert. It amazes me the journey a story can take. What started out as a small spark–a trip to the casino with my dad, the feeling of sadness that hit me in waves as I watched people feed quarters into slot machines–became something tangible for others to hold. I’ve read before and I’ve been published before, but this time felt particularly special. Maybe it was because so many friends (one traveled from Seattle for it) and classmates showed up to the reading–certainly one of the most captive audiences I’ve read to. Maybe it was because local favorites Kevin Sampsell and Lidia Yuknavitch were the headliners for the night (I, their humble opening act). It felt right to hold my story in my hands and crack it open in front of an audience. I was nervous in the minor heart attack, it’s not too late to run out the door way. As per my usual style, I arrived late to the reading, so aside from a quick trip to the bathroom to check my hair and then a trip to the bar for a calm-me-down glass of wine, I had no time to collect myself before it was time to hit the stage. Then, thankfully, came that moment I always know will come when I’m up on stage and everything simply quiets. That’s the moment I can’t turn back so I embrace it, take a deep breath, and start reading. I love that calm. It’s like standing in the eye of a storm, and even though everything moves around me in a whirlwind, I experience everything in cinematic slow motion. Not enough things in life give me that feeling. After the reading, I was able to mingle and make plans, breathe again. I embraced the warmth of compliments and congratulatory pats on the back. Then came the fun, the drinks, the live music, and the friends–back to the regularity of a Friday night. All the build up and then its over in a few minutes. The following day, I received a message on Facebook from someone who had attended the reading. It came from someone I didn’t know. the message read simply, “Father and Daughter was fantastic!” That small piece of encouragement to move to the next story, the next reading, the next fix.